Black Country Awnings is a sister site for Black Country Caravans & Camping, a family run business based near Birmingham in the West Midlands, UK. We sell caravan awnings and motorhome annexes online. 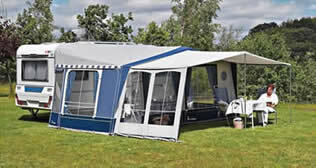 We stock many fantastic full caravan awnings from a wide range of manufacturers. 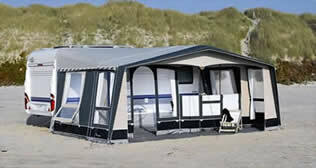 We have a great selection of caravan porch awnings and motorhome annexes. Catering for both caravans and motorhomes, our sun canopies are top quality. 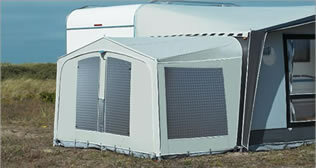 We have an excellent range of awning accessories such as annexes, inner tents and partition walls. We have a wide range of full awnings for sale in our accessories shop and awning showroom, which is the biggest in the West Midlands! We have several awnings on display and our friendly staff are on hand to help with any questions you may have. We also sell a huge selection of caravan and motorhome accessories. Our range of awnings is listed below, for more information please contact us. Although we supply many types of awning, most of our products are full awnings. We provide full caravan awnings through many different manufacturers, providing a diverse range of prices to suit your budget. 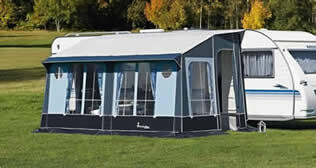 Products range from cheap to luxury caravan awnings - all at highly competative prices. Not only do we sell full awnings but we also have a great range of caravan porch awnings and motorhome annexes for sale. Porch awnings and annexes are specialised tents which fix to the side of your caravan or motorhome to provide extra real estate. Whilst not as big as full awnings, porch awnings offer space, shade and privacy at a fraction of the cost! Sun canopies are a lightweight canopy ideal for caravanners looking for a quick and easy method of providing protection from the sun at a low cost. As a cheap alternative to full and porch awnings, sun canopies are great for giving you shelter from the elements such as the sun, wind or rain. Easy to assemble, sun canopies are generally supplied with steel poles and guy lines which will take moments to erect, leaving you with more time to get on with enjoying your holiday!